Being completely obsessed with unicorns and mermaids myself I know how hard it is for my gran to shop for me, I know this because she always tells me so! It's always "I can never find anything you like Jordanne! 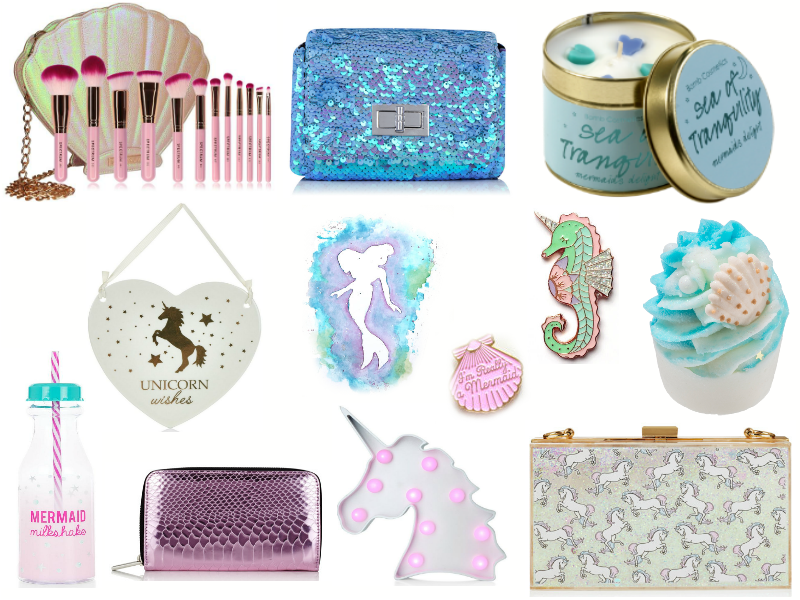 Here's money..." And that's how about 90% of birthdays and Christmas's go for me haha So I decided to put together a Gift guide for those of you out there who have someone in their life that LOVES all things Mermaids and Unicorns. I have included links to all the products above and will go into detail on some products. The Bomb Shell Brush set by Spectrum collections - This gift is truly perfect for anyone who loves both mermaids and make up, What better way to apply your make up than with these beauties! They are amazing quality. I have a post on them HERE if you want to check that out. Sea of Tranquility candle - I love the thought of this candle and I really want to smell it myself. For any mermaid lover it seems like a perfect idea because who doesn't love candles? plus I have had one from bomb cosmetics before and the quality is amazing! Little Mermaid Print - So I wanted to include this print which is from SweetAllureshop as I have one myself and I just LOVE it. It's super cute and is a great addition to my room. It's a great price plus you can choose which size you get. Sea Unicorn Pin - I love anything sea related as it reminds me of mermaids and such plus I love unicorns so this to me is just PERFECT. I really want one of these pin badges so I can imagine other mermaid and unicorn lovers would too. Marni Purse - This little purse from Skinnydip london reminds me of scales like mermaid tails and if I was a mermaid I would love to have a tail that colour! I think this would be a great idea as a present for mermaid lovers. Unicorn Clutch - I really really REALLY want this clutch as it's unicorns plus its glittery! I think any one who loves unicorns would appreciate this clutch as it's both useful yet fun. 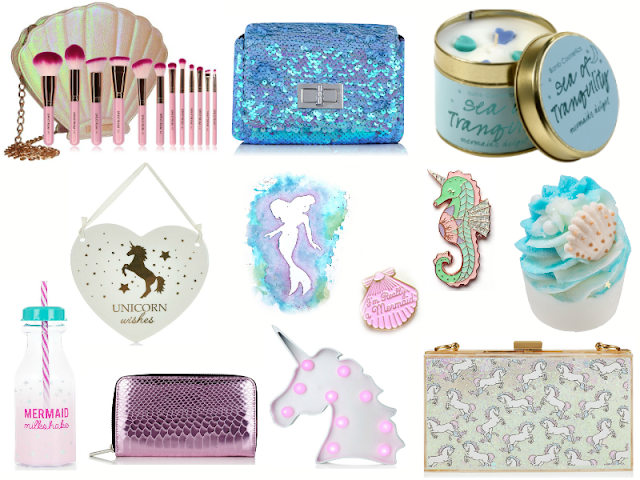 I LOVE the mermaid clutch bag - so cute!